At Camp Half-Blood, Percy Jackson meets his half-brother Tyson , who is a cyclops. The camp is later attacked by Luke Castellan (Jake Abel), who announces his plans to destroy Mount Olympus. Percy's mentor Chiron discovers that Luke has poisoned the magic tree responsible for the barrier that protects Camp Half-Blood, which Percy learns was created out of Thalia Grace, daughter of Zeus), who was killed by a cyclops. Annabeth Chase finds out that the Golden Fleece could restore the tree, and the camp's director, Dionysus, sends Clarisse La Rue, daughter of Ares and Percy's rival, to find it. Percy then sets off with Annabeth, Tyson and Grover Underwood to locate the Golden Fleece on his own. Before they leave, the Oracle prophetizes that either a half-blood child of one of the three prime gods will fight Luke, and the half-blood will have on their hands the chance to either save Mount Olympus or destroy it. As Percy is the only known half-blood of the three prime gods (Tyson is not considered a half-blood because he is half cyclops), he realizes the prophecy must refer to him. The Graeae give the group the coordinates to the island and leave them in Washington, D.C., where Grover is captured by Luke's men, who intend to use him as a sacrifice to Polyphemus (Robert Maillet), the creature that guards the Golden Fleece. 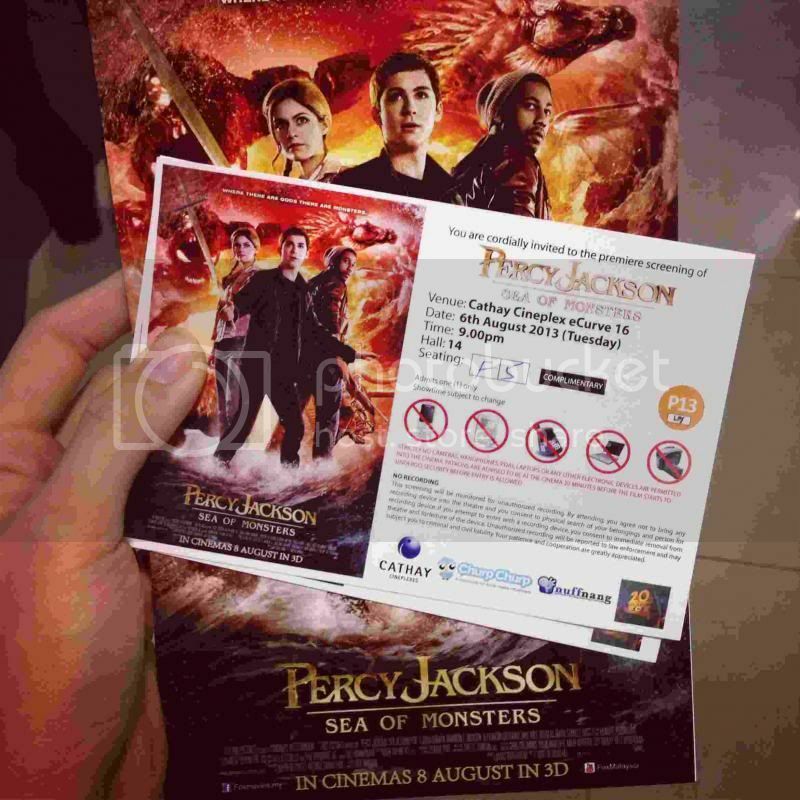 Percy, Annabeth and Tyson then meet Luke's father Hermes, who tells Luke is in a yatch. Percy, Annabeth and Tyson end up being captured by Luke's soldier, the Manticore, but escape using magic artifacts that Hermes had given them. The trio eventually reaches the Sea of Monsters and is swallowed by Charybdis, meeting Clarisse in its stomatch. They join forces to escape and reach CirceLand, an abandoned amusement park near Polyphemus' lair, where they rescue Grover and retrieve the Golden Fleece before being confronted by Luke, who reveals his plans to use the Golden Fleece to awaken Kronos. Tyson sacrifices himself to protect Percy from Luke's crossbow shot, and Luke steals the Golden Fleece and awakens Kronos. Tyson then returns, having been revived in contact with water, and rescues the others. In the ensuing fight, Luke and Grover are swallowed by Kronos before Percy realizes his magic sword, Riptide, is prophetized to be Kronos' only weakness. Percy's sword swing send Kronos's body back, piece by piece, to the container which held his remains, and Luke becomes trapped in hungry Polyphemus' lair. The Manticore mortally wounds Annabeth before being killed by Grover and Clarisse, and Percy uses the Golden Fleece to revive her. Returning to Camp Half-Blood, the group uses the Golden Fleece to restore the tree, and is surprised when it revives Thalia and restores her body. While the others celebrate, Percy realizes that perhaps Mount Olympus' fate might rest on Thalia's hands, not his. Did not watch the previous sequel and I find that this movie was ok because I love watching demigod movies. *wide grin* I wish that the story could be more exciting than this. Nevertheless, I am still looking forward to the next sequel of this movie. P/s: I find that Percy is darn cute. :P Rate of the movie: 3/5.